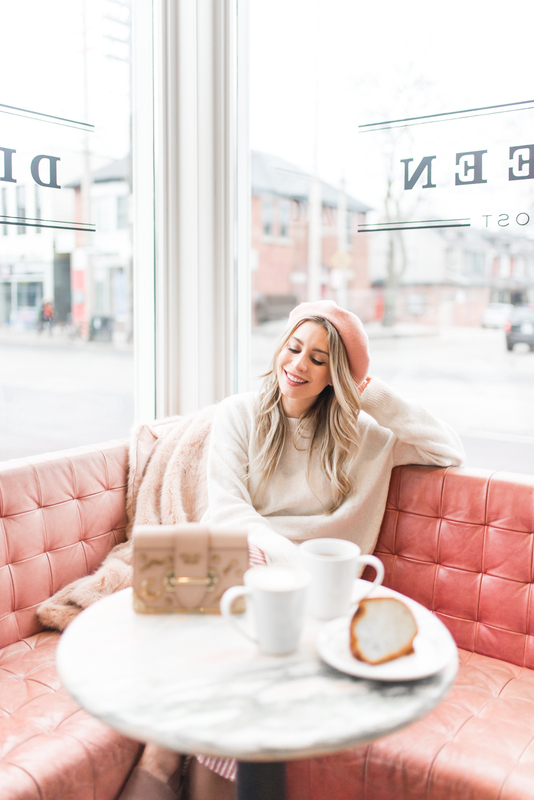 March 2018 | La Petite Noob | A Toronto-Based Fashion and Lifestyle Blog. Over the course of the years, the format of La Petite Noob has changed. While before I mostly just shared my outfits with you guys, I feel like now we know each other on a more personal level so I can share so much more; my thoughts and feelings, my travels, things like that. With all that being said, I still want to keep the element of personal style to the blog so now I'm happy to be sharing another outfit round-up with you guys - what I've been wearing lately, and details on how you can find the pieces too. Check it out, and let me know if you have any questions! What do you guys think? Do you prefer the outfit round-ups, or the traditional one-outfit-per-post. Let me know! For me, feeling beautiful in my own skin means being totally comfortable. I try to maximize feeling good about myself each day by practicing positive self-talk, taking time out each day to do something I love and to make sure that everything that I wear is comfortable - right down to my underwear. I not only want my undergarment to be comfortable and beautiful, but I also want them to be concealed; a special treat just for me that I can enjoy no matter what outfit I chose for the day. It sounds like I'm asking for a lot, but you can find it all in just one beautiful bra; the WonderbBra multi-way convertible bra. I was turned on to the WonderBra multi-way convertible bra, and since haven't looked back. This beautiful piece is literally the perfect compliment to every outfit, and will be your best kept secret - seriously, nobody will ever be able to see it. With up to 49 inner hooks (depending on a size) and removable straps, you can wear this same bra 8 different ways! I'm talking asymmetrical necklines, strapless pieces, halter-cuts; you name the trend and this bra can accommodate. And it's beautiful to boot, with beautiful lace accents that are virtually undetectable under clothes. The cups are unlined and foam-free, so this beautiful bra is incredibly light and comfortable - so comfortable in fact, that I often find myself lounging around at home in just my bra! In my quest to be kinder to myself and celebrate my own beauty, it always amazes me how feeling truly comfortable can work wonders on your self esteem. Starting from my undies and working outward, I'm happy to have the WonderBra multi-way convertible bra as my secret weapon to feeling comfortable in any outfit I chose for the day. People's opinions about Los Angeles are always very polarizing; you either love it or hate it. I myself absolutely love visiting LA and always try to visit as much as I can. There are definitely some irritating factors to consider about Los Angeles (mainly, the traffic) but I feel as though most of these irritants can be eliminated by choosing the right hotel. For this particular trip to LA, the main purpose was for Sabrina and I to attend the Create & Cultivate conference. The conference itself was downtown, but we knew that we wanted to spend the majority of our free time exploring different areas around the city: West Hollywood, Venice Beach, Silver Lake, etc. This meant that we would need to find an area to stay in that was in the middle of all of the places that we wanted to visit to cut down on the amount of driving that we would have to do. 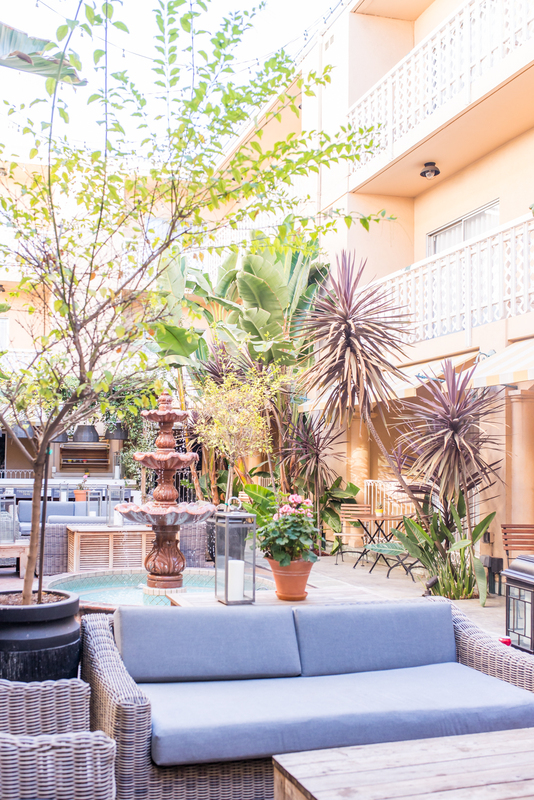 From which hotel we stayed at, to how we chose to get around, here are the logistics to our recent trip to Los Angeles. Location: While we didn't spend a lot of time exploring Hollywood, we found it to be the most central spot for us to hit up all of the areas we wanted to check out on our list while still being close to DTLA for our conference. Breakfast: Most people don't find themselves too hungry when they first wake up. I'm the opposite - I wake up ravenous. Because you need to drive almost everywhere in LA, I knew that our hotel needed to have coffee and a breakfast facility so that I could eat as soon as I woke up without any hassle. The Hotel Hollywood has an impressive breakfast, with a made-to-order omelette station and waffles that are complimentary to guests. Bonus points for hot coffee and orange juice too - a great way to start our long days of exploring! 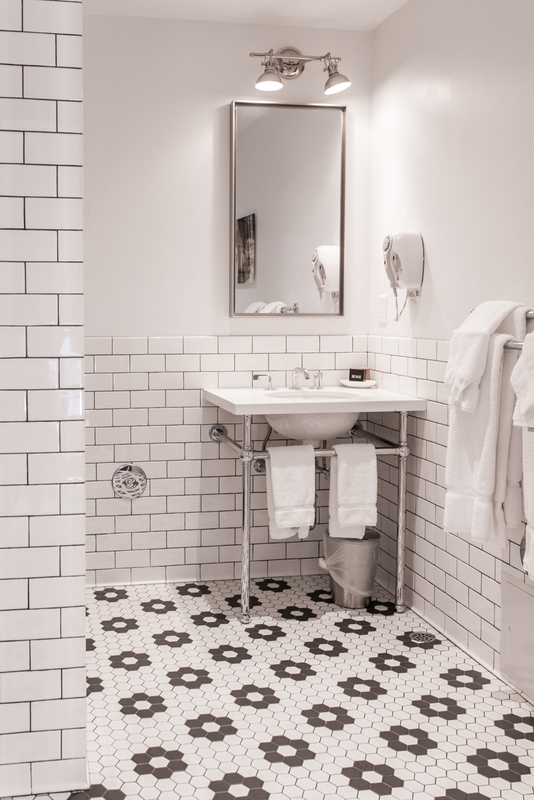 Design: I love smaller hotels with more boutique designs. Call me crazy, but I book all of my hotels with photos in mind and I just knew that Sabrina and I would have a great time capturing photos at Hollywood Hotel. From the beautiful courtyard, subway-tiled bathroom, to the pool with yellow-striped pillows, it was a photographic mission accomplished. Price: Hotels in Los Angeles are really expensive, and I didn't want our entire LA budget going towards a hotel. 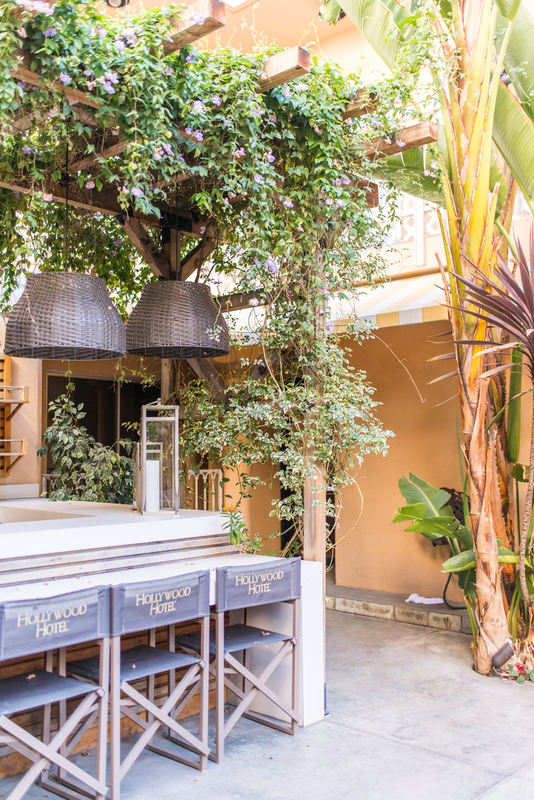 Hotel Hollywood is one of the most reasonably priced hotels in the area, and one that ensures that you have lots of travel budget left over for exploring what Los Angeles has to offer. The decision between renting a car and Ubering everywhere was an easy one for us: we chose to Uber. While it was slightly more expensive, the ease of not having to fight for parking was a huge benefit for us. Plus the traffic in LA is no joke, and it's a lot less stressful to deal with when you have someone driving for you. Because Sabrina and I weren't leaving the city limits at all, Uber made more sense for us. What do you guys think? Have you ever been to LA? What are your thought processes when booking a hotel? Let me know! Thank you Hollywood Hotel for our stay. All thoughts and opinions are 100% my own. If you guys follow me on Instagram or Youtube, you will have seen that Sabrina and I visited sunny Los Angeles a few weeks ago. While the purpose of the trip was to attend the Create & Cultivate conference, our second priority was to run around like madwomen searching for the most Instagrammable spots in LA - and we definitely were not disappointed. Here are some of my favourite, most Instagram worthy places in LA to mark down on your map for your next trip to Los Angeles. 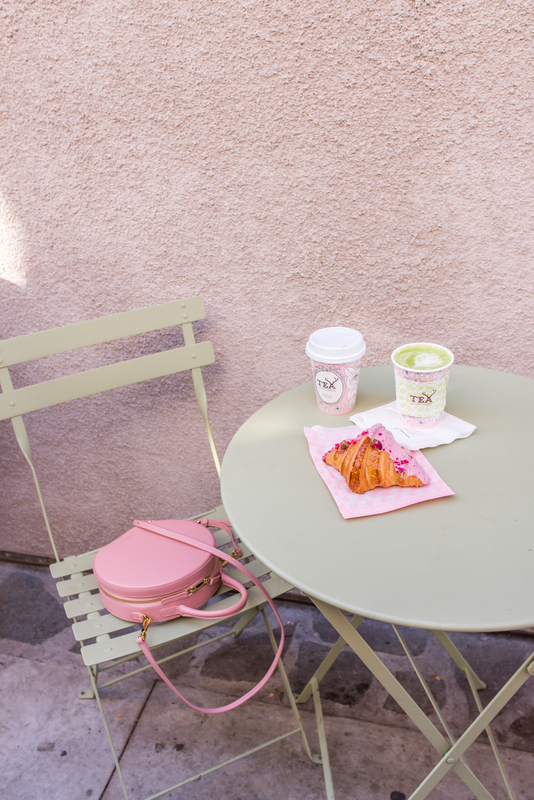 If you're someone who loves the colour pink as much as Sabrina and I, consider Alfred's Tea Room your mothership. This quaint, beautifully decorated little tea shop boast's an extensive tea menu, all served in Instagram-worthy cups. We visited this place multiple times and both agreed that, while the tea-based drinks are good, it's their pastries that really stand out. 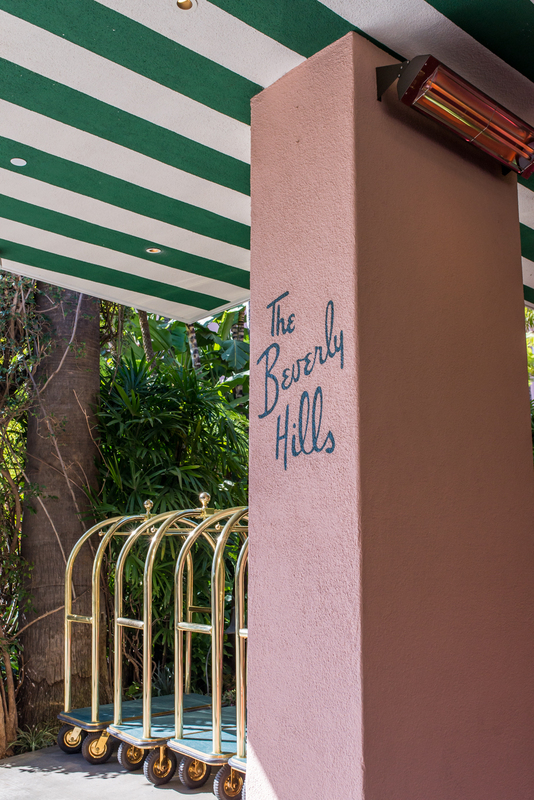 I knew from before we even landed in LA that I wanted to have brunch at the Beverly Hills Hotel Cabana Club, and it did not disappoint. The entire hotel is one big Instagrammable moment and, except for the pool area, you're able to take photos wherever you want. The brunch itself was delicious and while price-wise it's definitely a YOLO meal, in my mind it was well worth it for the experience. The newly opened Mansur Gavriel store on Melrose is almost too beautiful for words. While the store itself is beautiful, with an in-house café with indoor seating, I just loved the flower-lined courtyard outside. Another gem on Melrose, Sorella Boutique is where you will find the Instagram-famous Girls Tour wall. Grab your girls, grab a tripod (or a fellow tourist who also wants a photo) and grab this photo. Another Insta-famous café on Melrose, Carrera Cafe is where you will find your quirky lattes with fun art like Drake and a crying Kim K. The whole shop was definitely created with Instagram photos in mind, from the lattes to the floor tiles to the beautiful mural right outside. If minimal is more your vibe, The Assembly is a gorgeous café that will be right up your alley. Sabrina and I enjoyed strong americanos and some gourmet doughnuts in this light-filled space. 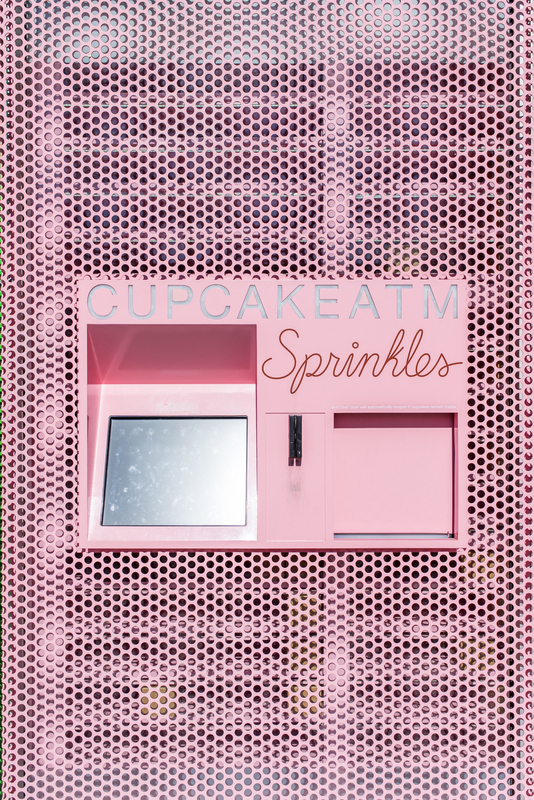 If you can walk by an all-pink cupcake vending machine in Beverly Hills and not take a photo, you're a stronger person than I am. 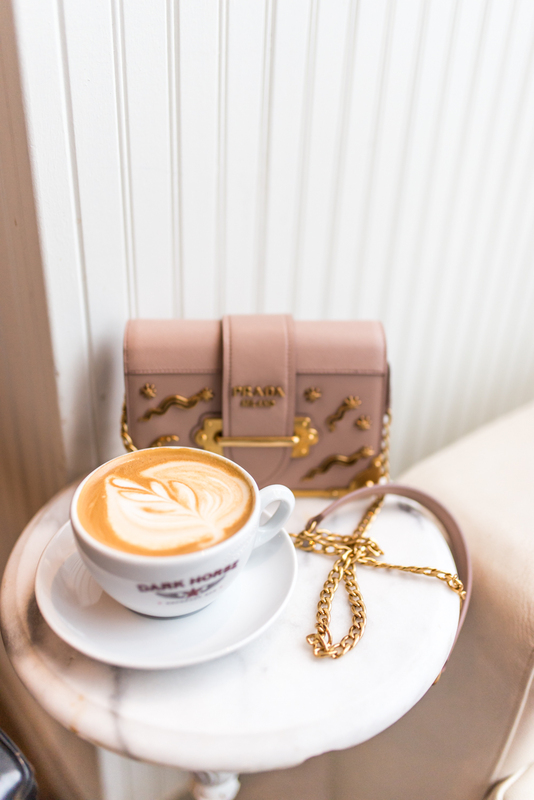 There are a few Alfred Coffees around LA and while all of the locations are ridiculously cute (and serve ridiculously good coffee) my favourite location is the one in Beverly Hills. A pink hearted mural on the side of the café? Yes please. Venice Beach is one of my favourite, quirky places in LA. You'll find plenty of Instagram-worthy photo opportunities, from the giant Venice sign to bike riding along the boardwalk. 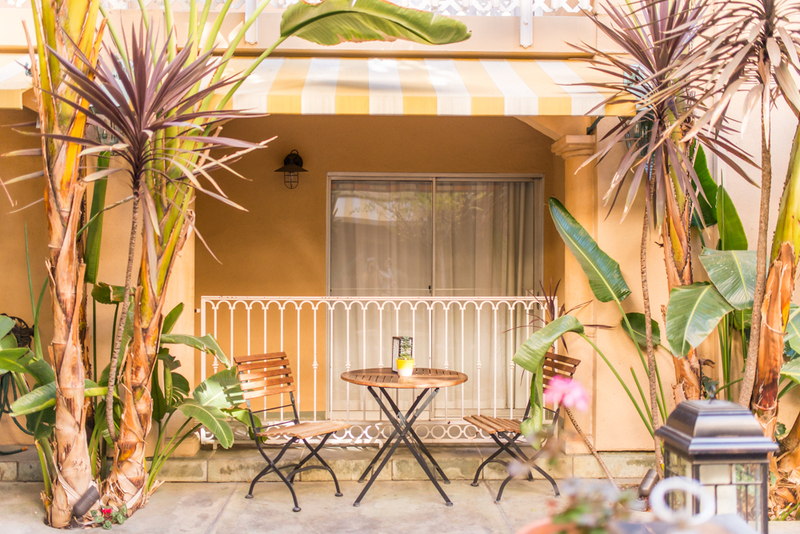 For a plethora of Instagram-worthy spots away from the chaotic beach, Abbot Kinney is the street you need to hit. So many beautiful shops and restaurants including The Butcher's Daughter, a beautiful plant-based restaurant and café. 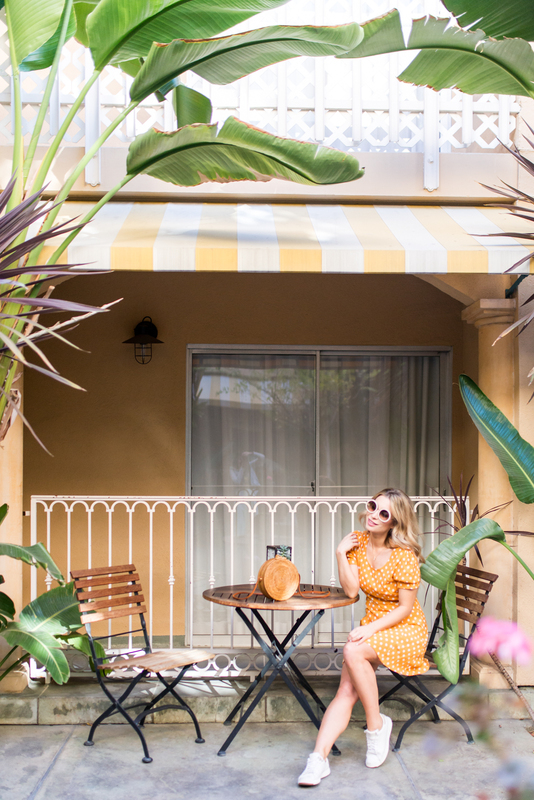 There are so many beautiful shops and cafés in LA that would make your Instagram feed proud, but these ones are definitely my favourite and the ones that I will be repeating when I head back to sunny Los Angeles in September. Have you been to LA? What are some of your favourite spots to visit? Let me know! Yesterday I was looking through my calendar, trying to plan the upcoming week when it dawned on me that I have now been blogging full-time for over a year. Looking back now from when I first made the decision to pursue La Petite Noob as my full-time career, it's incredible to think of how much has happened and how far I have come. While I feel as though I've documented my journey since starting to blog full-time, I have never really touched on the feelings and decisions I had to make when making that fateful decision to stop working a day job and commit myself fully to the blog. Seeing as how some of the most questions that I get have to do about blogging as a business, I thought that I would share 5 questions to ask yourself before deciding to blog full-time. 1. Am I Making Enough Money To Sustain Myself? This seems like the most obvious question to ask yourself before making a drastic career move, but it's also the one that is most overlooked. Here's the thing; if you're making money from your side-hustle, it's easy to feel as though you're doing well-enough financially to support yourself. For me anyways, while I was working I was using my paycheque to cover my bills and savings, and anything that came in from the blog was mine to play with - I felt like I was rich! This financial arrangement made it easy to fool myself into thinking that I would be able to easily support myself with only my freelance income. When I really sat down and did the numbers, calculating all of the bills and necessities that would need to be covered, I soon realized that my blogging income would just cover my basic necessities - a far cry from the disposable income I had to play with while working a day-job. After sitting down and getting real about the numbers, I was able to make a more educated decision about what life would be like when blogging full-time. As much as I was tempted to fudge the calculations, or under estimate how much money I would need to pay all of my bills to make the decision to go full-time with my blog easier, it was to my benefit to be as realistic as possible. 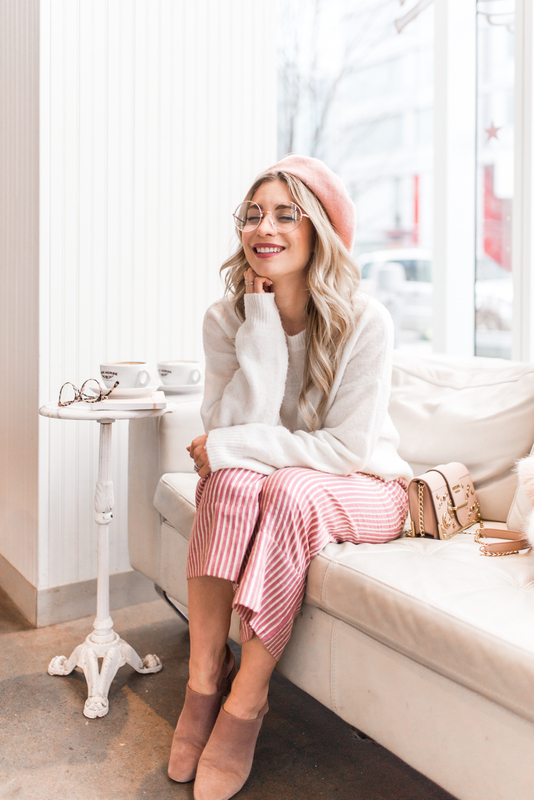 The process of realistically evaluating my finances helped me to manage my own expectations about life as a full-time blogger, and helped me to make an informed decision about choosing to blog full-time. 2. Do I Have Savings? I'm a huge advocate for having financial savings, no matter what situation you're in work-wise. Living paycheque to paycheque is a difficult way to live in general, and is particularly stressful when those paycheques aren't coming in consistently. Having a savings account to fall back on to get you through slow periods while blogging is absolutely paramount before making the decision to quit your job and blog full-time. 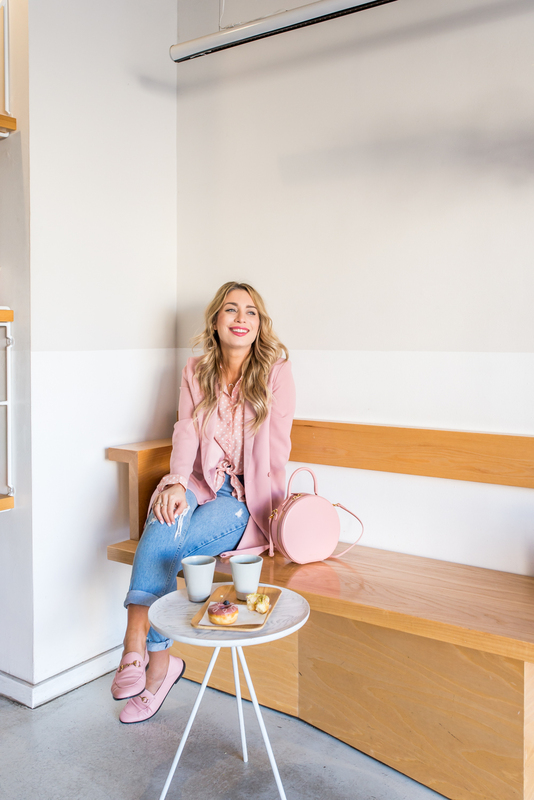 Even if you feel ready to make the leap into blogging full-time, but don't have a ton of money saved up, I would definitely recommend delaying that decision by a few months to help build up your savings account. No matter what level you're at with your blog, there will be slow periods. Having financial savings to carry you through the slow periods of blogging not only will help you from making bad career decisions just for the money, but will also give you some peace of mind. 3. Do I Have The Support Of My Loved Ones? This is a tricky one for me, since I don't necessarily believe that having the support of the people around you is imperative for making the decision to blog full-time - but it definitely makes that decision a lot easier. When I was first toying with the idea of pursuing my blog as my full-time career, my husband Brian was definitely not thrilled with the idea. I don't blame him; it's a new industry without any guarantees, and we're a young couple trying to save for our future. It took me a long time to slowly try to change his mind, but with time (and a few meltdowns) I was able to show him that my side-hustle could really work for us if I made it my career. As much as I love blogging full-time, it's still a job and with any job there are hard days. Especially in the beginning, I had a really tough time adjusting to being my own boss and had a lot of bad days. Being able to talk about the hard days with your loved ones is so important, and so much easier when they understand and support your career move. 4. What Is My Plan? If you're thinking about quitting your job to pursue your blog as a full-time career, you need a plan. A business plan, a plan for your content, a plan for budgeting, a plan for your weekly schedules, a plan B, a plan for absolutely everything. 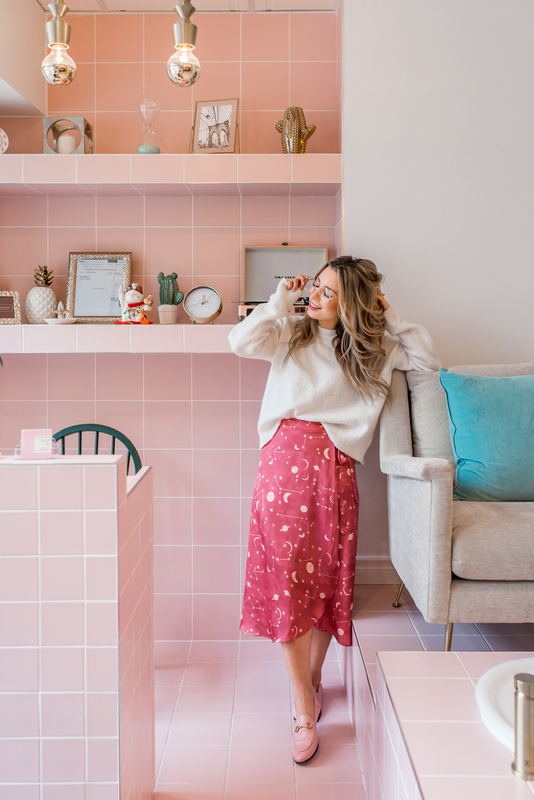 Your side-hustle will turn into your full-time career, and that transition will be so much smoother if you take the time to plan and become as organized as possible. 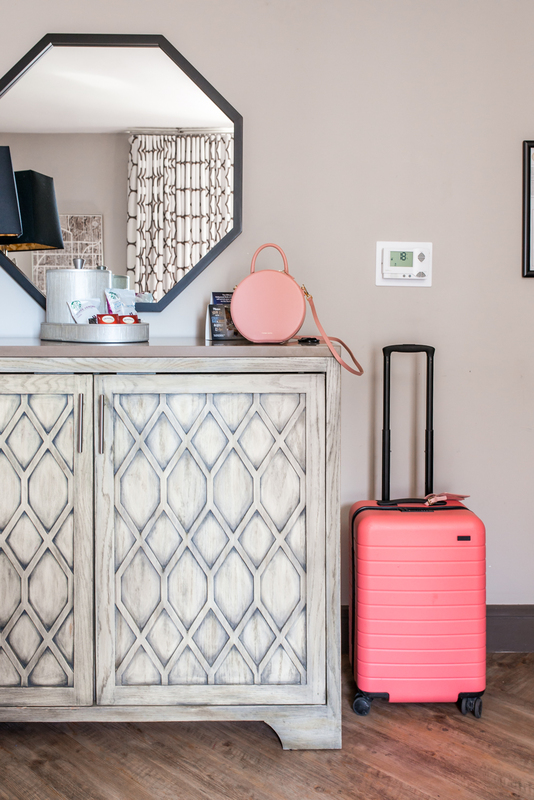 While I wasn't nearly as organized as I should have been when I start started blogging full-time, I quickly realized the importance of having a plan. 5. Is This My Passion? The decision to quit your job and blog full-time is difficult, and you need to ask yourself some really tough questions and be honest with your answers. The number one, most important question to ask yourself is if your blog is truly your passion. Being your own boss is not an easy feat, but it is all 100% worth it if your company is your true passion. Having a passion for your own blog means being driven to continue, even when times get tough and the money isn't coming in. Having a passion for your blog means that you're able to go to bat for yourself when others are trying to negotiate your worth. The passion you have for your own blog will be your motivation and what drives you forward. Everything else can be sacrificed, but passion is paramount. I love being able to have La Petite Noob as my full-time gig. The decision to blog full-time wasn't easy, but I'm glad that I was able to ask myself these 5 questions to make the transition a little easier. What do you guys think? Are you thinking of making the jump to blog full-time? What questions did you ask yourself if your blog is your full-time career? Let me know! Do you guys have a travel bucket list? I definitely do, and while mine is full of exotic locations to visit, it also has hotels and properties that I've always dreamed to be able to stay at. 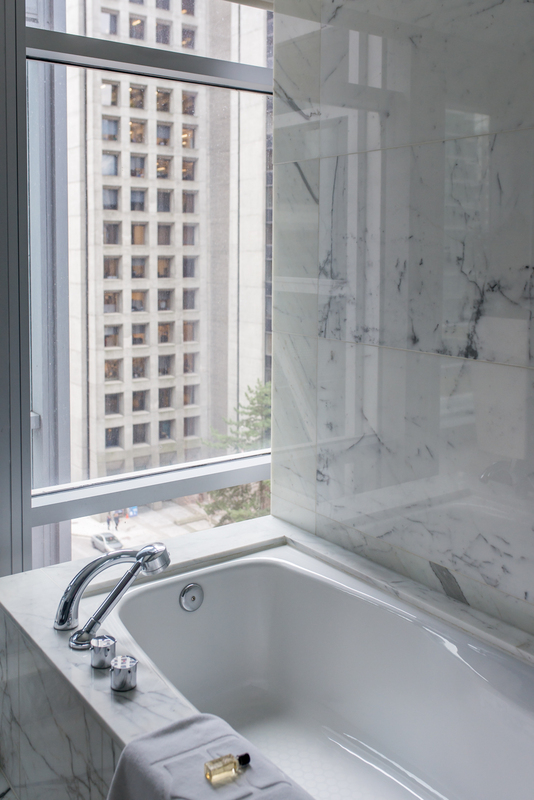 The Shangri-La has been on my travel bucket list for years; ever since I saw a photo of their floor-to-ceiling white marble bathrooms. 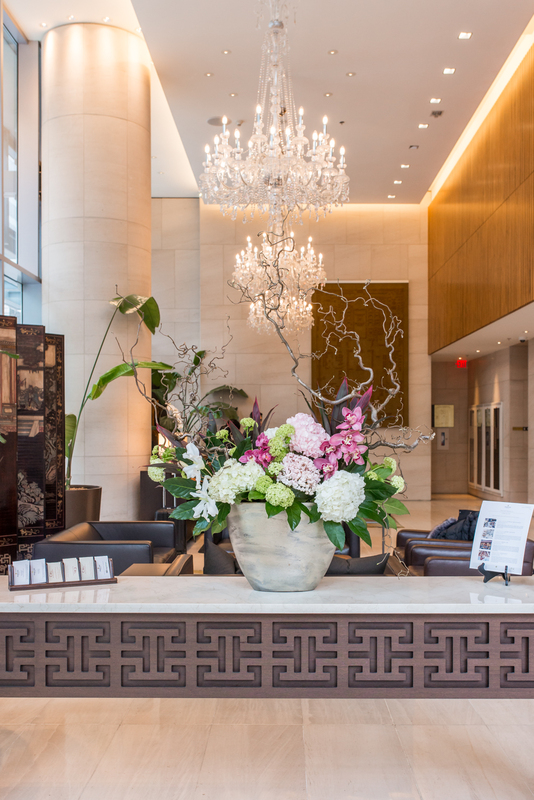 I've visited their Toronto property for high tea and to enjoy their spa, but have never had the opportunity to stay in one of the Shangri-La's opulent hotels. 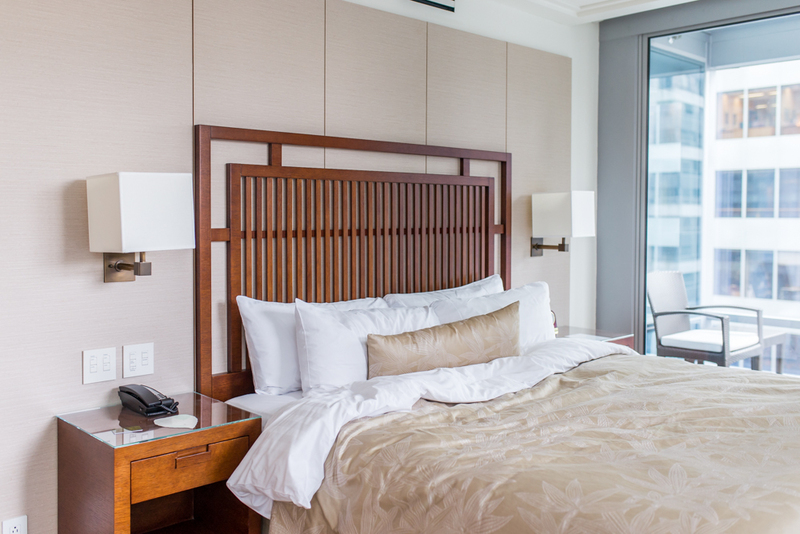 With this in mind, you can imagine how elated I was to find out that I would be making a night's stopover in Vancouver before flying home to Toronto, and staying at the Shangri-La Vancouver. 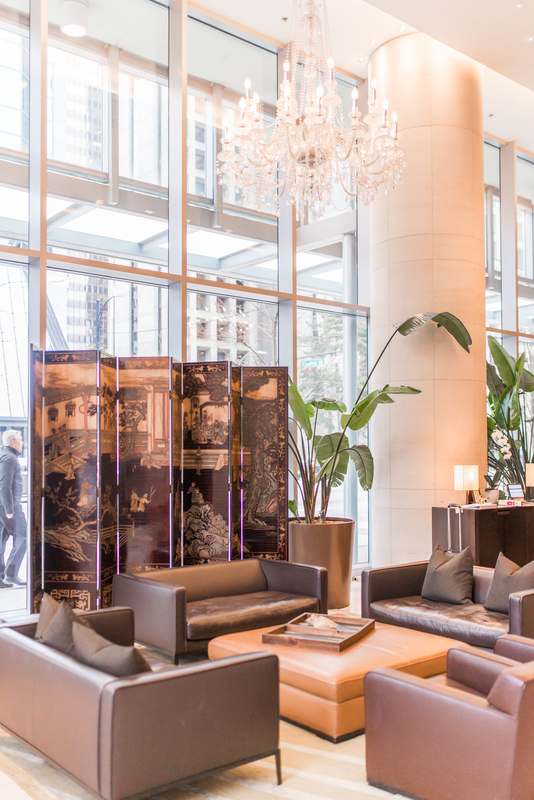 Located in one of my favourite areas in Vancouver (where all of the high-end designer stores are located,) the Shangri-La Vancouver wow-ed me from the moment I stepped foot into the property. 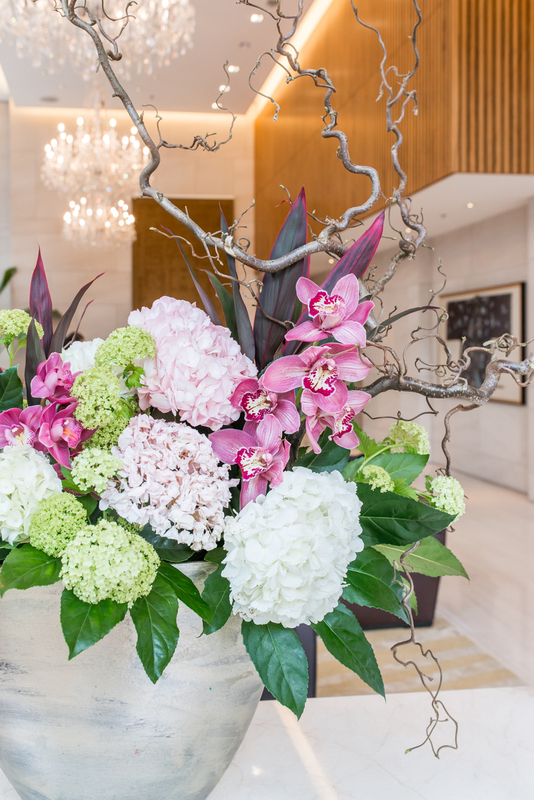 The lobby is impressive with high ceilings, cascading lighting pieces and grandiose floral arrangements. 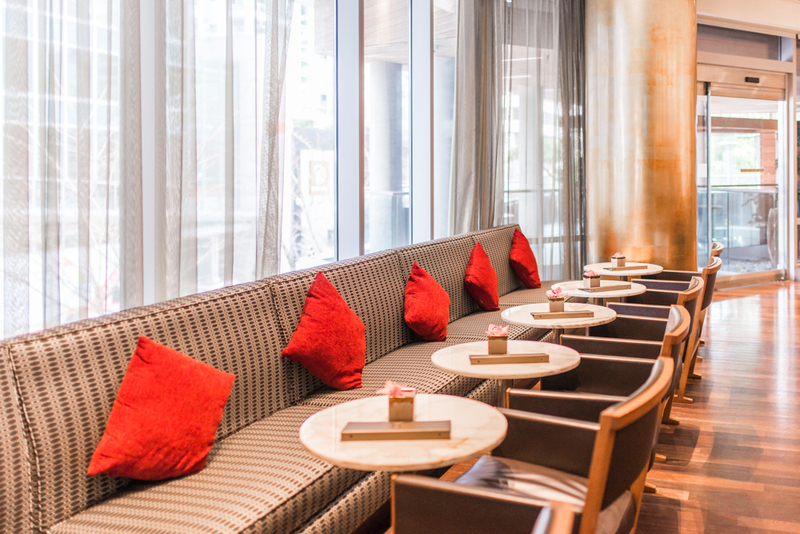 An upscale lobby can sometimes be intimidating, but the warm smiles that greeted us when we first walked into the doors had us completely at ease and set the tone for our stay. 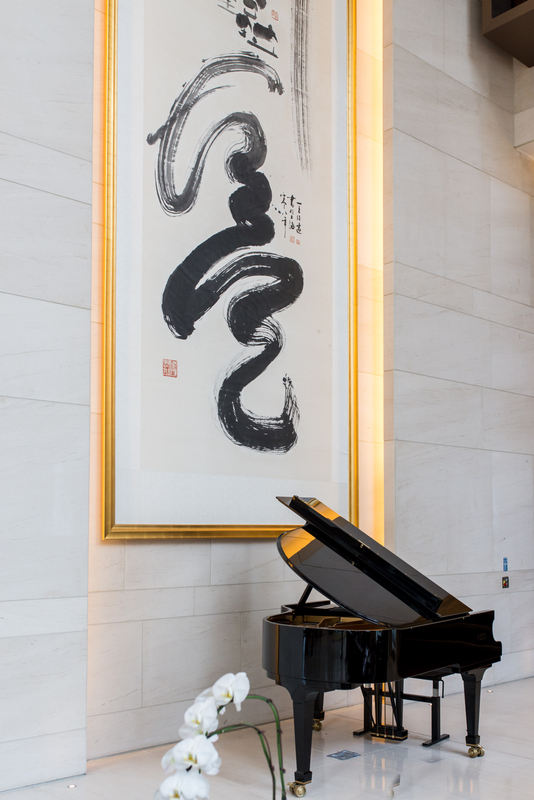 The attention to detail and hospitality of the staff is what set the Shangri-La apart for me, and is what transforms this property from a beautiful hotel to an experience that I will never forget. I had a room to myself for the stay, and it did not disappoint. 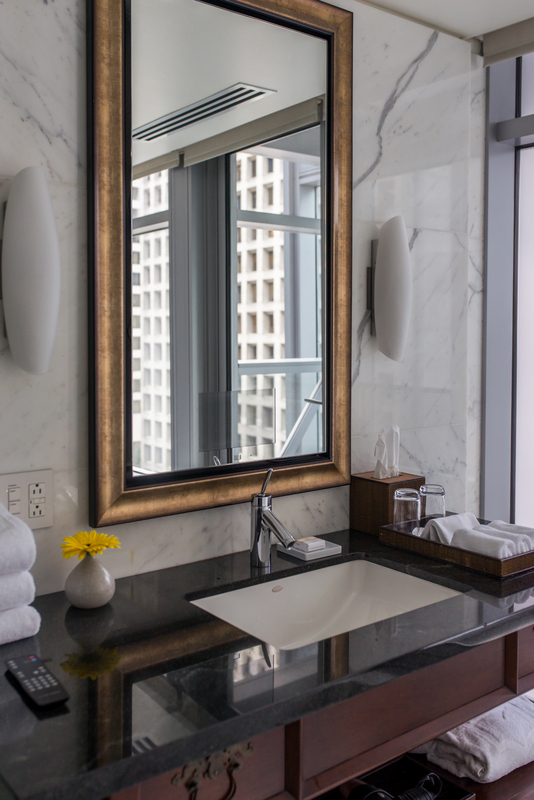 The room itself is large; with a seating area, a desk for working, generous closet and the Shangri-La's famous white marble bathroom. 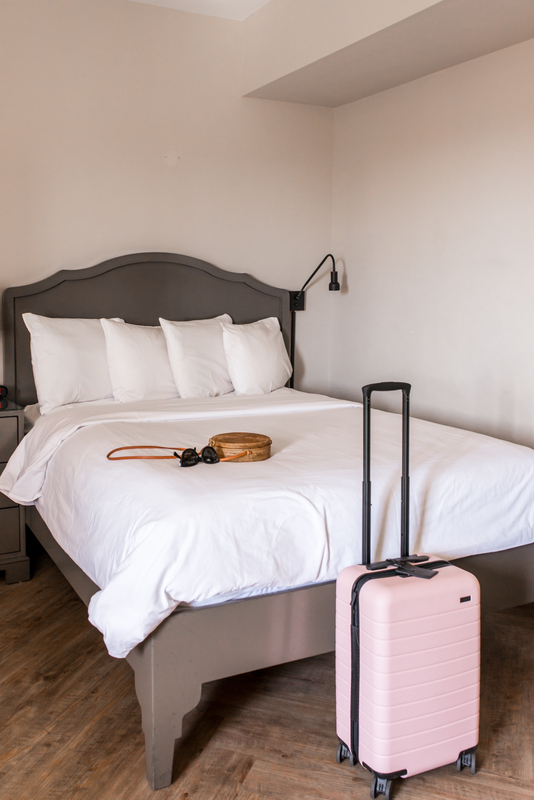 The flow of the room put my energy immediately at ease, and what I enjoyed most about my stay was how the features of the room seemed to be intuitive. If I wanted to raise or lower the blinds, I didn't even have to look twice to find the switch that would allow me to do so. It was the same for the lights as well as the curtains; even the 'do not disturb' button could be easy found inside. Once I got settled into my room, I immediately changed into one of their lush white robes (a ritual I tend to stick with in all hotels) and brewed myself an espresso with the in-suite machine. I still have vivid memories of being completely at peace in this moment, enjoying the cityscape view from my room with the ocean and mountains in the distance. 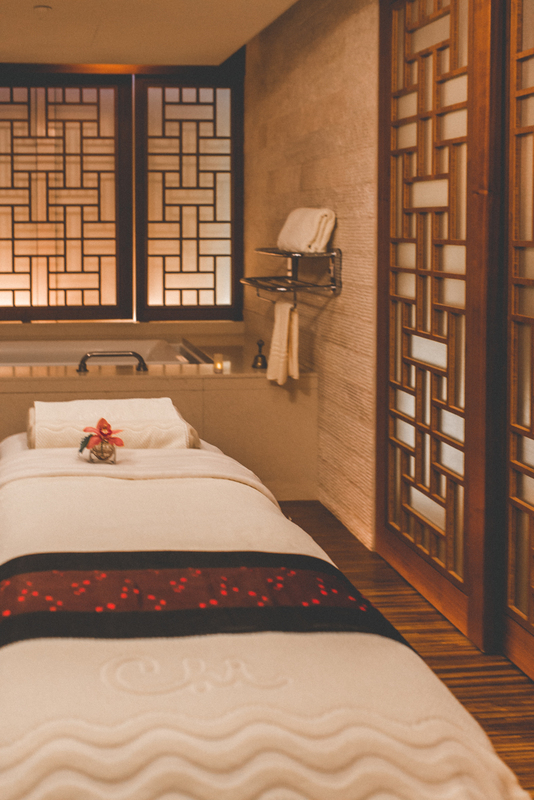 The fact that we were able to enjoy another spa treatment on our West-Coast trip was absolutely incredible - and for that spa treatment to be done at Chi, The Spa at the Shangri-La was icing on the cake. You guys know that I love a spa treatment, and the treatment that we had done during our stay at the Shangri-La will forever be remembered as one of my favourite spa treatments that I've ever experienced. Lauren and I both chose the spa's signature Aroma Vitality and it was 80 minutes of pure bliss. I love a multi-step spa treatment and this one did not disappoint. A foot bath, a eucalyptus steam treatment and a massage are all included in the Aroma Vitality treatment and the most luxurious part is that you experience all three steps without having to leave the treatment room. After our treatment, we were invited to relax in the relaxation room where we indulged in chocolates and deliciously addictive ginger tea - seriously, I must have had 10 glasses. 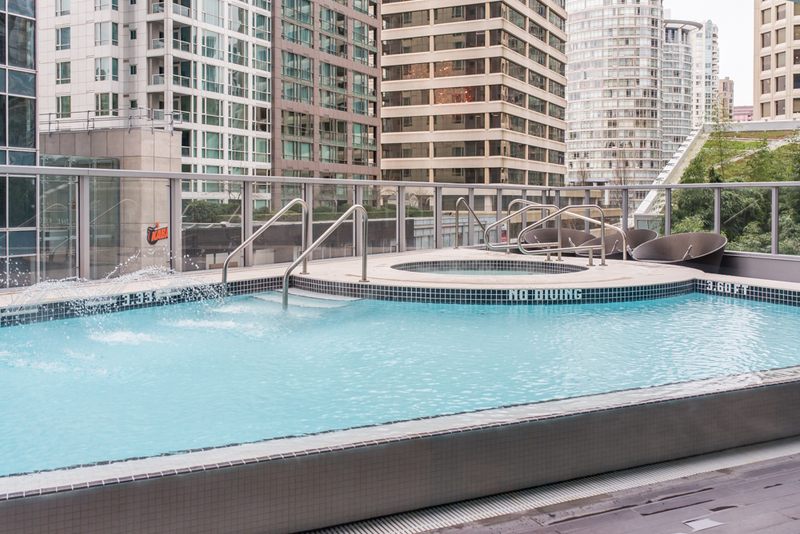 I can't stress this enough; if you find yourself in Vancouver and want to treat yourself to some self-care, please head to Chi, The Spa at the Shangri-La. I'm already looking forward to my next trip to Vancouver so I can experience the same treatment. 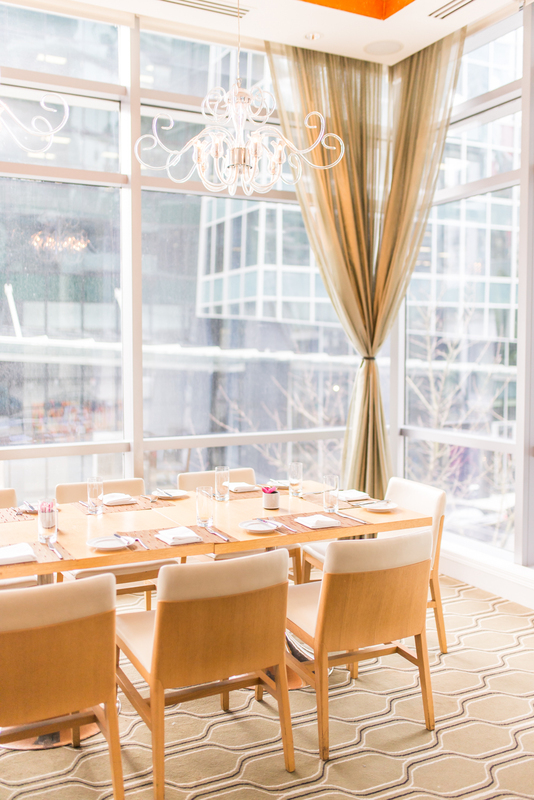 As if our relaxing stay at the Shangri-La in Vancouver couldn't get any better, we were treated to an incredible meal at MARKET by Jean-Georges, an up-scale restaurant that's housed on the hotel property. I would definitely recommend MARKET by Jean-Georges as another treat-yo-self experience should you find yourself in Vancouver. Some standouts of the meal for me were the scallops as an appetizer, a delicious short rib for my main course, and an absolutely decadent peanut butter chocolate bar as dessert. Before I knew it my short trip to Vancouver had come to an end, and I reluctantly checked out of the Shangri-La to head to the airport. I'm so grateful to have been able to experience the luxury of a Shangri-La property, and look forward to doing so again for my next trip to the west coast. If you guys are looking for things to do while in Vancouver, check out my city guide from my last visit to the city. Thank you so much for the Shangri-La Vancouver for my stay. All thoughts and opinions are 100% my own.